People hold up signs during a rally against hate in Berkeley, California, Aug. 27, 2017. 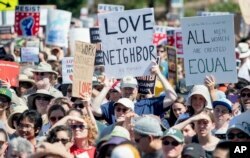 Counterprotesters filled the streets of Berkeley, California, Sunday even though a scheduled far-right rally that had been the target of their demonstration was canceled. 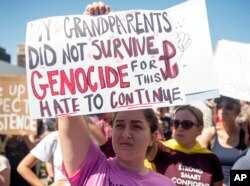 Sunday was the second day of demonstrations in the San Francisco Bay area. On Saturday, huge crowds of counterdemonstrators turned out to oppose another right-wing gathering, billed as a Patriot Protest rally, but that, too, was canceled. San Francisco Mayor Ed Lee declared victory over a group he branded as inviting hate. Police in Berkeley, across San Francisco Bay from the larger city, had set up barricades around a park where the rally was to have taken place Sunday. Authorities also erected metal barricades manned by officers.By midmorning, police in riot gear stood guard at park entrances as dozens of people milled around across the street. People were allowed to enter the park once their bags were checked for banned items, including baseball bats and skateboards. Anyone with a dog or covering their face with a scarf or bandana also was barred. People hold up signs and shout while listening to speakers during a rally against hate in Berkeley, California, Sunday, Aug. 27, 2017. Tense but brief skirmishes erupted when a group of more than 100 left-wing protesters surrounded, shouted at and attacked a handful of right-wing demonstrators, including the head of a group that had canceled its event Saturday in San Francisco. In one case, a journalist laid on top of a man who was being beaten by a group. Police said they arrested at least 13 people. A separate counterprotest took place at the University of California, Berkeley, campus despite calls by university authorities for demonstrators to stay away. Later in the day, the crowd left the campus and marched to the park to join the counterprotesters there. The precautions were put into place to prevent the violence that has plagued previous protests in Berkeley. In February, an outburst against plans for a speech by former Breitbart News editor Milo Yiannopoulos caused hundreds of thousand of dollars in damages at the University of California campus and to surrounding businesses. Danielle Nanni holds up a sign while listening to speakers during a rally against hate in Berkeley, California, Sunday, Aug. 27, 2017. Yiannopoulos' appearance in February was canceled, but he has said he will return to Berkeley at the end of September, at the invitation of a conservative-leaning campus newspaper. In response to the violent protests in February, President Donald Trump had threatened to revoke federal funding if the university's policy was to allow protesters to silence speakers with divergent opinions. In response, California’s Lieutenant Governor Gavin Newsom contended that Yiannopoulos holds unacceptable “white supremacist” views, and said “hatred has no home” at the state's public universities.